How do Big Ag companies try to change opposition to genetically modified organisms? They simply change the technology. They dance around the technical terms used to define how a gene has been altered, so that they can slither through a government agency loophole to unleash that new technology on the unsuspecting masses – that is, until the ever-shifting tectonics of the GM industry are again exposed. Crispr technology is the biotech industry’s latest attempt to befuddle us. Maybe the die-hard Monsanto-Bayer haters won’t buy it, but those who tend to embrace new technologies blindly in the name of supporting ‘science,’ just might. Here’s how the industry is trying to get around ‘GMO’ labeling while still feeding you and your family a synthetically altered plant, grown from a patented seed. Because Crispr simply ‘edits’ a gene in a plant, not to be confused with traditional hybridization that has been practiced by indigenous cultures for centuries, instead of genetically altering it by adding ‘foreign’ genes, regulators wouldn’t have to label food products made with it as ‘GMO.’ If I’ve already lost you, it’s understandable. This whole topic, at first glance, seems to be splitting hairs. As we’ve already seen with previous GM technologies, traits that are meant to be controlled in a plant – such as a Bt toxin, for example, which is supposed to only kill the ‘pests’ which eat Bt toxic GM plants, propose a whole host of additional environmental and health concerns. It was only later proven that Bt toxin was alsotoxic to mammals, AFTER the Bt crops were planted across thousands of hectares of land. Why scientists didn’t see a problem with placing a pesticide inside a plant to begin with is a topic for another conversation. With Crispr technologies, the very same likelihood is possible. DNA targets can be missed, and genetic changes can ensue that might not even show up until several generations later. CRISPR works by using an enzyme called Cas9 that uses a guide RNA molecule to home in on its target DNA, then edits that DNA to disrupt genes or insert desired sequences. It is so cheap to do in lab, you could order a kit for about $30 dollars and edit genes yourself. While that ‘democratizes’ gene editing, it also opens a Pandora’s box of other possible problems. Crispr is being called the biggest game changer in GM technology, yet the makers and users of this technology don’t want it to be labeled ‘GM’. It is also being heralded as cheap, and easier to use than all other previous gene-editing technologies. Which begs the question – if almost any DNA sequence can be altered, even in humans, who decides what DNA is kept, and what DNA is changed? Those with eyes to see are already questioning whether the break-neck speed at which Crispr is being applied is really addressing the ethical and safety concerns such experiments can bring about. Potentially risky genome edits could disrupt an entire ecosystem. So, though it is ‘easy’ in a lab, once that technology – just like other genetic modifications – are let out into nature, scientists don’t really know what will transpire. Despite these concerns, Crispr altered crops would bypass biosafety regulations by simply deleting plant genes without adding any foreign DNA. Considering that we still don’t know what all our DNA is for, only recently still calling most of our own DNA, ‘junk,’ do we really think scientists on the biotech roller coaster are wise enough to foresee which edited genes might alter a genome so irrevocably, that an animal, or plant and all those it is linked to in a food chain or ecosystem won’t be negatively affected? Regulators don’t seem to care – but know this: you may not be eating genetically modified organisms, but you’ll be eating genetically edited ones, without any disclosure whatsoever. 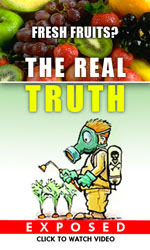 This article (Monsanto Outsmarts the GMO Resistance) was originally created and published byWaking Times and is published here under a Creative Commons license with attribution to Christina Sarich and WakingTimes.com. It may be re-posted freely with proper attribution, author bio, and this copyright statement. Please contact WakingTimes@gmail.com for more info.